Card sorting is the step that generally follows a content audit when building intranet navigation. This guide will help you create an IA structure using terms that match users’ perspectives resulting in a navigation that makes sense to your organization. Yes, they require a lot of effort but we have a few tricks! Make it easy for your staff to find what they need. Card sorting is a structured exercise that asks intranet users to sort a list of sample intranet content into logical groupings. It can be done online using software, or offline (in-person). During the exercise, a user is provided with a list of examples of intranet content. The user then sorts the items on the list into groups of related cards and labels each grouping. 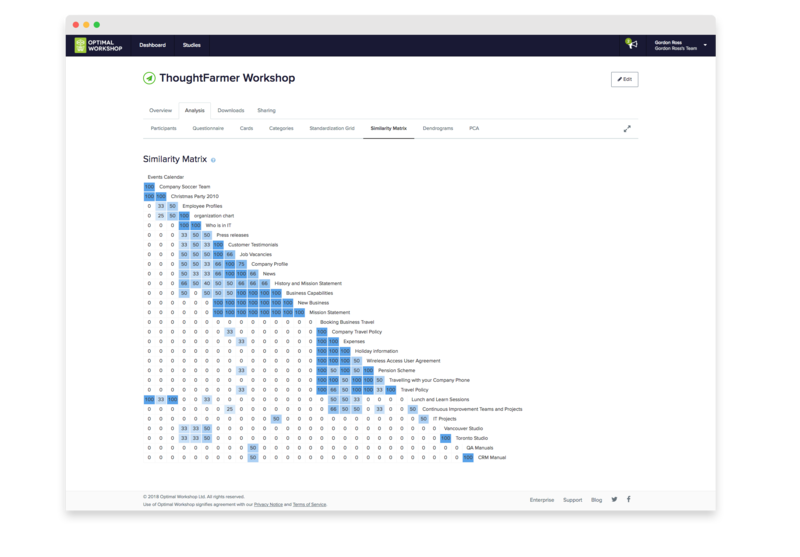 When a number of users have completed the exercise, the organizer compares the results to identify patterns and insights as to where similar groupings did and did not occur. There are two types of card sorting exercises: closed card sorting and open card sorting. In a closed card sort, participants are provided with the categories to sort the cards. In an open card sort, there are no predetermined categories and participants are given cards and asked to sort them in a way that makes sense to them. Because open card sorting is more common and useful in the early stages of building an intranet’s IA, we only cover open card sorting here. Why is card sorting important? 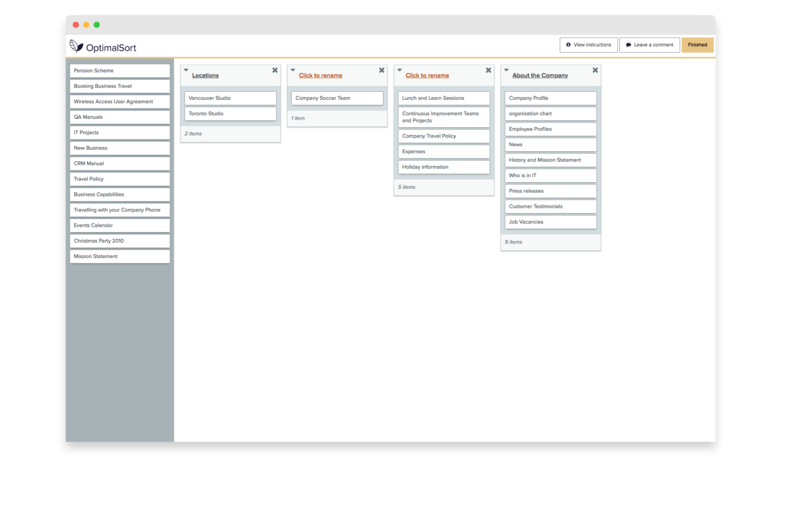 Card sorting helps build IA structure using terms and groupings that match users’ perspectives resulting in a simplified navigation. Many poorly designed intranets are built by one person or a small group who create the navigation around their own personal perspectives. This can lead to sites that are self-centered, overly prescriptive, or mechanical. The site ends up matching how the designer thinks everyone else should see the content, rather than how users actually understand the content. Card sorting helps intranet teams look beyond their own blinders and build an IA employees are more likely to adopt. Card sorting is frequently used in the design of public facing websites — the ones we can search for and find through Google, Yahoo!, etc. — as well as for intranets. But intranet card sorting carries a few specific characteristics and benefits that are different from card sorting for marketing-focused sites. For starters, the information on an intranet is uniquely focused on a company, and employees need the information to succeed in their daily work. In a company, if an employee can’t find what they need, they will look elsewhere. And unlike card sorting for public websites, the participants in an intranet card sorting exercise are your users and will return to the site day after day (hopefully). The participants could end up being stakeholders, super users, or intranet champions. Card sorting plays a dual role, both as a design and engagement tool. By involving users in intranet development you achieve stronger sustained adoption. Additionally, any employees who participate in card sorting are less likely to complain about the resulting IA. For more details on how participatory intranet design can lead to increased user engagement and adoption see our article 15 ways to engage users in building a social intranet. New site, redesign, or section update: People typically use card sorting when a new site will be built or redesigned. It can also play a critical role in updating a specific section of content rather than a whole site. Following a content audit: The content audit provides a snapshot of all your potential intranet material. From the content listed in this snapshot, you can select relevant content for card sorting. Before task testing: Task testing is an evaluation/validation step that helps refine your information architecture. But first, you must complete a round of user-centered exercises such as card sorting to come up with a draft design. Before visual design (sometimes): For many sites, card sorting (and task testing) come before the visual design stage (wireframing, sizing and selecting page elements, selecting colors, etc.). With out-of-the-box social intranet software, this is less relevant. In this case, the site navigation becomes the largest effort of your intranet site customization and can take place before, during, or after visual design. Without a live site: Card sorting, task testing, and creating your information architecture activities can occur without having a live site. As long as you document the results in a spreadsheet, you can apply the information architecture later. Traditionally, card sorting was completed in a room where participants physically stacked index cards. Today, web-based card sorting tools offer a flexible online alternative. Our favorite tool is OptimalSort, which offers easy setup and rather extensive analysis and data visualization features. Alex Manchester of Step Two Designs recently wrote a more in-depth comparison of the two methods in his article ‘Card sorting: online vs. offline’. While online card sorting software does provide useful analysis and visualization results, you’ll still need to analyze the results. Card sorting aims to capture employees’ perspectives on how different pieces of information fit together, but not all employees have the exact same perspective. The way people see and use a specific piece of content may vary based on their job levels, departments, locations, etc. It is therefore important to involve employees who span the spectrum on various criteria. Try to involve employees from throughout the hierarchy, from admins up to executives, as well as people from every department and location. Not only does this help you capture a full array of perspectives, but it also supports your user engagement efforts. Renowned usability expert Jakob Nielsen wrote a blog post which provides some scientific insights into how many users to test in card sorting. We presume that prior to the card sorting you have completed a full content audit that provides you with a rich list of content to select your examples. To select topics for cards, begin by first scanning your full content audit. You’ll want a total of 50 to 60 cards, each with an individual piece of content/topic. Building a new intranet is a tremendous opportunity to learn about your organization. You may discover that people in different locations and roles use very different information than you use. But you don’t want to learn this lesson by picking cards that are foreign to some of your testers. If people see cards they don’t understand, they will have trouble completing the exercise and may feel the intranet is not relevant to their work. To address this issue you can complete a comprehensive content audit and then select the content you think is used across the entire company. Note that if your content audit revealed large gaps in your existing material or you have big dreams about new content for the new intranet, it is okay to include future content in the card sorting. You also may find it easy to use a spreadsheet to list and track the topics for the card sort. Will you include only individual pages and files, such as “Travel Expense Form,” or will you move up to a broader section/folder level of content, such as “Travel forms”? These two examples offer different levels of granularity. One is a specific piece of content while the other is a section that contains specific pieces of content. Without a consistent level of content granularity, you may confuse users and skew results. Ask “Can this card fit as a topic underneath any other card?” If the answer is yes, you may need to replace broader content with more specific content (or vice versa). The goal of a card sort is to surface users’ mental models and assumptions about content. So try to avoid listing manuals, guides, etc. or similar terms that pre-suppose content groupings that don’t make sense to users, and potentially skew results. Once you’ve got a list of 50-60 cards, type up a brief description for each. A description should be a very brief at-a-glance statement that clarifies a card’s meaning. You don’t want to over-explain a term and provide words that will heavily influence how users sort the cards. Once you’ve created your list of cards along with brief descriptions, log in to your selected online card sorting tool and enter your cards into a new card sort. After saving your new card sort online, run a few tests to make sure it is working properly and that the cards and descriptions display correctly. Once you are satisfied with the card sort and have fully tested it, select a closing date and set the card sort to go live. You can leave the card sort open from two days to one week. As you begin analyzing the results, look for both general insights and specific ideas for how to craft the top two levels of the new intranet’s navigation. How do users group sample content? What labels do users write to describe groups of content? Depending on the tool you are using, it may include features that can help you visualize this information. For example, you can look at a list of phrases (in this case, Categories provided by OptimalSort) your employees used to group information. Employees may be using similar phrases to describe different content, revealing their different mental models. On the other hand, if the groups with similar phrases have similar content, it shows a high degree of agreement and we can be confident that the phrase is used to describe a certain set of content. Another example provided in OptimalSort to visualize groupings of content is the Similarity Matrix where the darker the blue in the cluster, the higher the agreement between employees on which cards go together. For more information on the different analysis tools provided by OptimalSort, you can visit their Card Sorting 101 page. Not every insight will offer a concrete path forward. The results may highlight unclear trends requiring further exploration in task testing. Or, perhaps you’ll discover that people associate a specific piece of content with two different departments, which may require cross-linking. For example, employees see “paychecks” as tied equally to “Finance” and “HR.” This may lead you to use task testing to validate a proposed “Time & Pay” section which would house all content and links related to paychecks. Intranet card sorting can be fun, quick, and useful, but becoming an expert can take some time. If you’ve never run a card sort before, take an experimental approach and learn along the way. You could even start with a small card sort around a specific collection of content (like HR material). Any card sorting is better than none, so even if you stumble through it, the resulting insights and user engagement will be well worth it. Of course, if you are really stuck we offer services to guide you along.